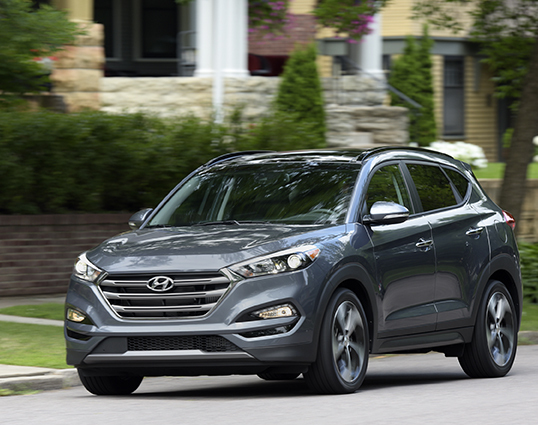 The 2016 Hyundai Tucson is the first compact crossover to use a double-clutch automated manual. I drove Hyundai’s radically revised Tucson in Minneapolis Tuesday. Impressions of the drive experience are embargoed until Monday, but here are a handful of factoids to whet your appetite. The Tucson is the first compact crossover to use a dual-clutch automated manual transmission. The 7-speed gearbox boosts efficiency and provides a more satisfying driving experience than a continuously variable transmission (CVT) would. 51% of the 2016 Tucson’s platform comprises advanced high-strength steel. Body rigidity is up 48%. Chassis improvements and sound-deadening measures reduce cabin noise to levels below those achieved by the segment’s best-selling models. The new up-level engine — a 175-hp (195 lb-ft of torque at 1500 RPM) turbocharged and direct-injected 1.8-liter four — tops the highway mpg of last year’s optional engine by 5 highway mpg in Eco trim and by 3 mpg in Sport and Limited trims. A new Lane Change Assist system measures the closing speed of an approaching vehicle in an adjacent lane to determine whether the Tucson driver can safely change lanes. No more trying to move into the same lane, at the same time, as another vehicle.